The following steps demonstrate how to use MailBee.NET Objects library in your applications. Generic version 2.0\MailBee.NET.dll (for .NET Framework 2.0 or higher, Client Profile compatible). Can be used with higher versions of .NET Framework as well. Ews component is not supported by this version (.NET Framework 3.5+ is required). 3.5\MailBee.NET.dll - .NET Framework 3.5 version. Adds support of Ews component. 4.0\MailBee.NET.dll - .NET Framework 4.0 version. Featureset is almost the same as of 3.5 version. 4.5\MailBee.NET.dll - the version optimized for .NET Framework 4.5 or higher (supports more features such as async/await methods). netstandard1.3\MailBee.NET.dll - .NET Core 1.0/1.1 version. Based on 4.5 version but has significant limitations. See .NET Core Edition topic for details. netstandard2.0\MailBee.NET.dll - .NET Core 2.0 version. Based on 4.5 version with a few limitations. See .NET Core Edition topic for details. uap10\MailBee.NET.dll - UWP (Universal Windows) version. It's close to .NET Core 1.0/1.1 version but has its own specifics. See UWP Edition (Universal Windows, UAP 10.0) topic for details. There are multiple ways for this, NuGet is the easiest option. 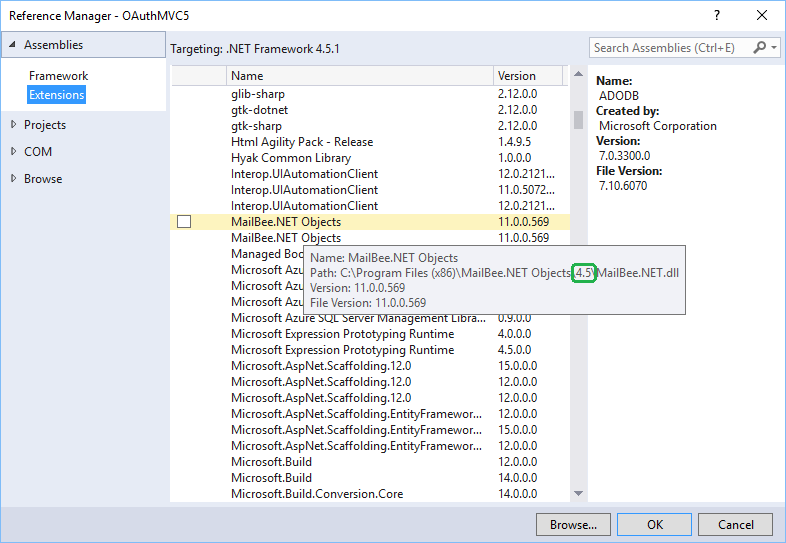 The latest version of MailBee.NET Objects assembly appears in your project. If NuGet is not an option.. In the steps below, it's assumed your Visual Studio project is named EmailApp. In the Solution Explorer, right-click the project name (EmailApp), and select Add Reference command in the context menu. In the appeared Add Reference dialog, find MailBee.NET Objects for your .NET Framework version (in case if you installed multiple versions). You may need to enlarge this dialog window to see file paths of the dlls because .NET Framework version of each dll is stored in the path, e.g. "C:\Program Files (x86)\MailBee.NET Objects\4.5\MailBee.NET.dll"). Alternatively, if you have a newer version of MailBee.NET.dll (more recent than the one which came with the installer) or the version you're looking for is not in the list, you can click Browse button and manually locate MailBee.NET.dll file. Then double-click the reference to add it into the list and click OK. Now MailBee.NET Objects library gets referenced from your application. In the properties of the reference added, make sure Copy Local setting is True. Again, this is only important if you have multiple MailBee.NET entries here (for different .NET Framework versions). In the steps above, we uploaded a copy of MailBee.NET.dll into the project folder and referenced this copy. The original MailBee.NET.dll is no longer needed. The application can be easily XCOPY deployed using this method. You can find the detailed guide on how to reference MailBee.NET.dll at Import namespaces and set license key article (the article belongs to "IMAP and POP3" guide but the approach remains the same for all MailBee.NET components). To reference MailBee.NET Objects library in non-Visual Studio application, you should manually upload MailBee.NET.dll file into the /bin folder under the root folder of your application. If there is no /bin folder, you should create it first. The application referencing MailBee.NET Objects library in such a way can take advantage of XCOPY deployment. Once MailBee.NET Objects library is referenced from your application, the next step is to import namespaces declared in the library, into your application. In the code below, we import all the available namespaces. You may keep only those declarations of namespaces which are actually used by your application. Depending on your MailBee.NET edition, some namespaces may not be available (e.g. EWS component is not available in .NET Core and UWP). To unlock the product in trial or permanent mode, you need to assign the license key. The license key can be specified in config file (app.config, web.config, or machine.config), in Windows registry (SaveKey and SaveKeyGui utilities can place the license key into the registry), or in static (Shared in Visual Basic) MailBee.Global.LicenseKey property. See Using License Keys topic on how to obtain and specify the license key. Now you can use MailBee.NET Objects classes in your application. In this sample, we send a simple e-mail message with a single line of code.